X- rays are forms of energy that are absorbed by highly dense objects such as bones and metal, which in turn, leave bright imprints on an x-ray film. Non- dense objects, like flesh and clothing let X-rays pass through, leaving prints that are faint. Dental X-rays are an important routine for dental care for both adults and children. Not only do they reveal potential problems caused by hidden plague. In addition to detecting common problems with teeth, dental x-rays can help detect gum disease and even osteoporosis. They are performed on a routine schedule depending on each patient’s individual needs as determined by a dentist. There are two types of dental x-rays. They include bite wing and periapical. The bite wing x-ray is taken when the teeth bite down together and shows the crown portions of the top and bottom teeth. 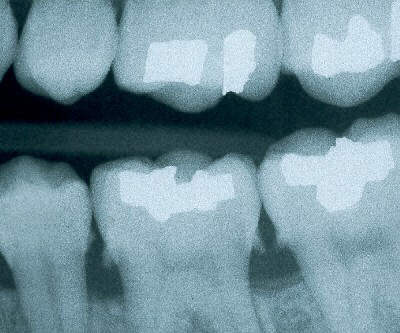 The periapical on the other hand is a more selective x-ray taken to show one or two specific teeth from crown to root. Dental x-rays are recommended because they show the position, number, size of teeth and because they are able to detect the presence of cavities before they appear on the tooth’s surface. At times, cavities form from plaque that is lodged between the teeth where a dentist is not able to see. X-rays are also performed to further investigate any suspected abnormalities, including gum disease, abscesses, abnormal growths and cavities outside of the scheduled radiograph schedule. They detect areas of decay, cracks and sills in between teeth that cause intolerable pain. Through the help of x-rays, tartar build up, cavities and tooth decay on the side of the teeth are detected and multiple outbreaks can be prevented. The images allow the dentist to discover the precise location of these and other conditions to ensure the most effective treatment. Routine dental x-rays also detect impacted teeth, which can be a problem from childhood to adulthood. In case of an injury, they help to determine the type and extent of injury. They serve as an alternative method of screening for osteoporosis in older adults. People with dentures, braces and invisalign must first get a radiograph of their teeth so the dentist can make the assessment if their teeth are anatomically fit for the procedure and if any hindering teeth should be removed in the process. Dental X-rays procedures should be facilitated sparingly to prevent excessive radiation which can cause permanent, encroaching damage to delicate body organs.